If you've been reading this blog at all, you would know I'm completely addicted to making ice cream. It started over a year ago with Guinness Ice Cream; it's rare for me to use recipes I haven't created, but that was the first and only time I've used some else's ice cream recipe. Since then I've been making it up; might have had something to do with the 15 yolks in that recipe! 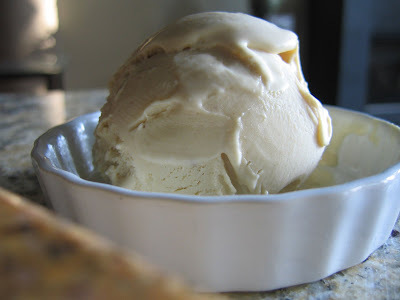 The idea for the pine nut ice cream came from Dave and I trying to come up with a flavor to match the anise cookies we were making for Easter. Sure, a basic orange, lemon or even coffee would have paired well with the anise, but I do like to try for 'random' flavors. Plus I see the pine nut as a very Italian nut. This may be the creamiest ice cream I've created yet. So creamy that you could almost eat it straight from the freezer without letting it thaw slightly. My friend Carolyn thought it reminded her of the Spanish turron (nougat) candy from her days of living in Spain. Once again, this is slightly savory, not a super sweet ice cream- so one small scoop will do. And I think it's a more of a holiday ice cream rather than an everyday- but go nuts! 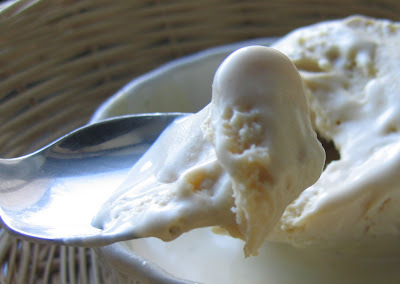 When you're craving a truely creamy ice cream, this is the one! Try it today and tell me you're not Fat and Happy! Begin by warming the cream and milk (make it hot, but do not boil it) and toasting the pine nuts. Begin to blend, adding in small scoops of the warm cream mix to help the nuts blend. Continue to blend until completely smooth. Pour the blender mix back into the cream pan, heat to just below boiling. Temper the egg yolks with the hot cream. Over medium heat, stir until the mixture thickens and coats the back of a spoon. Be careful not to push this step too fast using high heat, you don't want to cook and scramble the eggs. Strain the cream to get any nut chunks out of it. Cool in an ice bath. It's now ready to be placed into your ice cream machine, follow directions that came with your machine. At this point I prefer to let the ice cream sit in the refrigerator overnight before freezing in the ice cream machine- I've tested this theory before and I truly believe it helps the ice cream to be smoother and more flavorful. But if you need it immediately, go ahead and make it, it's still going to be fabulous!